Whenever I'm headed to Downtown Los Angeles for an excursion or errand, I try to schedule it so I can stop by Izayoi for dinner. Izayoi is a modern Japanese eatery in Little Tokyo that manages to successfully combine traditional izakaya food and high-quality sushi. I like to describe it as "gourmet izakaya." But what's truly special about this "pub" is that it also offers excellent sushi, which isn't the norm at izakayas. The only reason I rate the Izayoi sushi 4 stars, and not the full 5, is that you don't get the full sushi "experience" here. There's a small sushi bar, yes, but sushi is not the raison d'etre, so the offerings can be limited, and the interaction with the chefs rushed. Still, the quality of the fresh fish of the day consistently ranks up there with the 5-star joints. 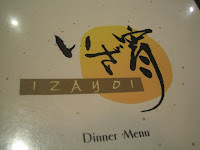 I read unconfirmed reports that the folks behind Izayoi came from Sushi Ryo in Hollywood, which would confirm that the chef(s) have good fish-monger connections. 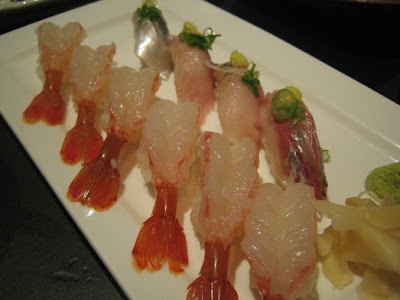 Buttery amaebi (sweet shrimp) and tender, subtly fishy aji (a mackerel that typically tastes and smells less fishy than saba). 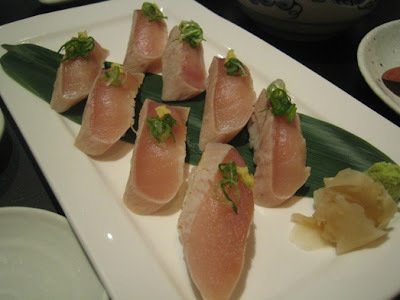 Albacore: super-tender with just the perfect morsel of horseradish garnish. 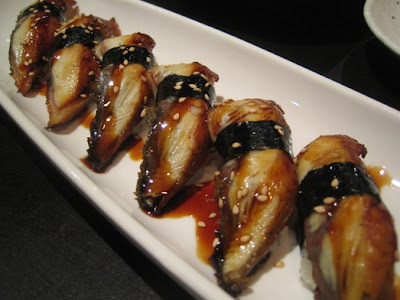 Perfect unagi: broiled just enough to crisp the surface and unleash the oils in the meat, topped with the right dose of sauce and a sprinkling of goma (sesame). And the lovely red snapper pictured at the top of this post was everyone's favorite - a light, clean flavor, and perfectly tender in texture. 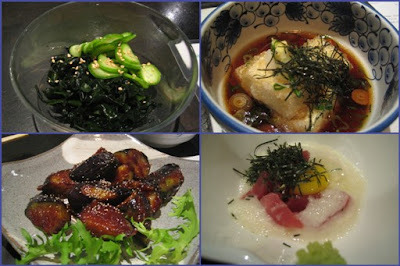 Clockwise from upper left: cucumber and wakame (seaweed) salad, the traditional agedashi (fried) tofu (in a very subtle, not overly salty, broth); yamakake (grated mountain yam with chunks of raw tuna); broiled miso eggplant (the miso provides carmelized sweetness to the nasu). The homemade tofu: silky smooth and sublime, flavored oh-so-subtly with the broth. You can also order it served simply with ground sesame sauce on it. 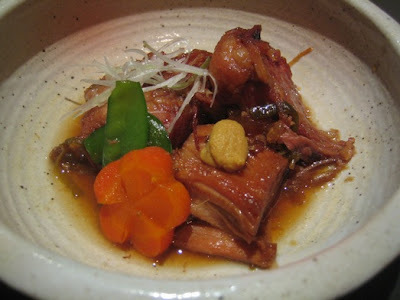 The sauteed pork belly, made with melt-in-your-mouth kurobuta (literal translation: black pig; kurobuta is the Kobe beef-grade of pork). Izakayas are numerous in Little Tokyo, but I find myself always heading back to Izayoi because the versions of comfort foods here are a notch above the others in quality, plus I know I can also get fresh, out-of-the-ordinary cuts of raw fish. 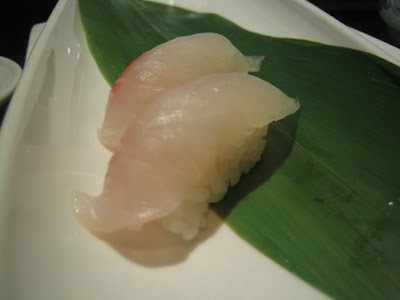 Yes, the prices may be a tad higher than the more casual izakayas in L.A., but you do get the quality that you pay for. And it's a great place to bring a mixed crowd of friends; the vegetarian options are numerous (as expected, the vegetarian in our group Saturday loved the sesame spinach, a homestyle staple), and there are also plenty of meat and fried options for the non-RawFishionados. 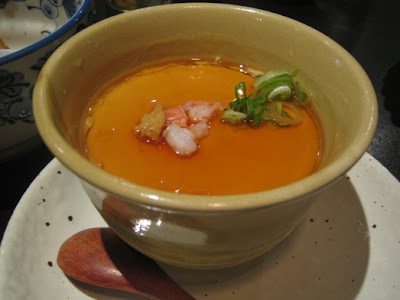 Still, if you go, I'd recommend sticking to the non-fried dishes to get a real taste of the traditional, fresh and subtle flavors that make izakaya fare so satisfying. Oh, and one more tip: the yaki onigiri (grilled rice ball, another izakaya staple) is not listed on the menu, but you can ask for it. I ordered one at the end of the meal Saturday, just to see how good it is, and it was perfect: nicely crispy on the outside, but still steamy-soft on the inside, basted with the right amount of teriyaki sauce so that the sauce dripped into the rice but didn't overwhelm it. My friends and I gobbled it up so quickly I forgot to snap a photo. Sorry! I'm dyin' heah!! You're blog is making me soooo hungry. But seriously, now I know where to look when I'm going to be traveling somewhere and I want a good restaurant before a show.